Patellofemoral Joint Knee Replacement or PJR is a open surgical procedure that allows me to replace the damaged or arthritic patellofemoral or kneecap portion of the knee joint with a new resurfacing. On the thigh bone (femur) we use a metal surface and on the patella (kneecap) we use a plastic (polyethylene) surface. 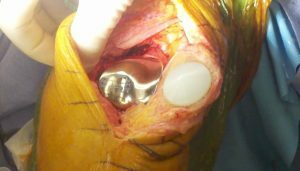 This allows the patellofemoral portion of the knee joint to be replaced with metal on plastic articulation. A smooth range of motion is achieved. The design that we use is the Zimmer Patello-Femoral Joint System. This is a special design that allows for achieving the best knee bend(flexion). The polyethylene kneecap glides smoothly over the new femoral surface. This advanced prosthesis is designed for more normal activities and longer lifespan. On the day of surgery, the anesthesiologist will discuss with you the best anesthesia for you including a nerve block. You will then be taken to the operating suite where surgery, will last approximately 1.5 hours. You will then be in the recovery room for approximately 40 minutes. He will then be transferred to your hospital room for your recovery. We expect you to be hospitalized overnight in which time you recover from surgery achieving good pain control, use of the walker or crutches, independence in daily activities, and early exercises. After your discharge from the hospital, you will attend physical therapy as an outpatient.